Summary: Labelled a troublesome boy by his old school, Teddy’s mother’s boyfriend decides to send him to St. Iggy’s, a Catholic boys boarding school. Once there he makes friends and gets along well with his classmates, but the priests and brothers who run the school often abuse their power through the use of physical discipline and intimidation. When one of the priests begins using Teddy’s friend Cooper for sexual favours, Teddy feels powerless to stop what becomes Cooper’s gradual descent into depression and hopelessness. The one good part of their lives comes in the form of Rozey, the school’s handyman, who befriends them both and acts as a friend and father figure. After tragedy strikes, Teddy seeks to avenge Cooper by holding the priests he feels are responsible accountable, only to find their protection is more pervasive than he ever could have imagined. Review: I can’t write that I love A Troublesome Boy by Paul Vasey because I don’t. It’s a painful read dealing with serious and mature subjects featuring adult abuses of power in positions of trust. But while Vassey’s book is gritty, the reason why it is such a painful read is because his characters are well-drawn and relatable. He hooks his readers into the story, and they become witnesses to Father Prince preying on Cooper’s vulnerable and sensitive nature. What hurt me most as a reader was how Father Prince used Cooper’s quest for love and acceptance against him, gaining his trust and becoming his confidant only to turn it into something sordid. Even though Teddy’s efforts for getting justice are futile, I was glad he continually questioned his surroundings. Being a troublesome boy may have been an undesirable trait to his educators, but it ultimately saved him from sharing Cooper’s fate. The character growth in Vasey’s book is thoughtful, and I did love his exploration of the difference between being defeated and destroyed through Teddy and Cooper’s stories. The first time I read Vasey’s book, I questioned the ending. Teddy’s father seems to appear from nowhere, and after years of no communication with his son suddenly they are ready to ride off into the sunset together. He apologizes and everything is fine between them. The second time, however, I appreciated it. I realised that by being expelled from school and picked up by his dad, he got the happy ending Cooper would never get. He had a place to belong and people that loved him, and thankfully because of that he would not end up like Cooper. My heart broke for Cooper, but that realisation helped me to not completely fall apart after finishing the story. It was a kindness on Vasey’s part, easing the ending of the book just a bit. But I wish things could have been different. Those days Cooper and Teddy had with Rozey were some of the happiest they’d ever had, and I just wanted Rozey, the only genuine, reliable, and responsible adult in their lives to adopt them and take them home. In that sense, Teddy’s father picking him up isn’t so far-fetched after all. “‘Ever wonder why they’re such bad-tempered old men?’ said Klemski. 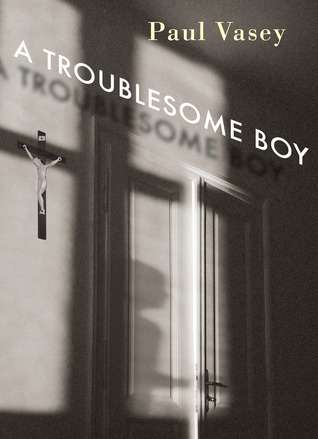 A Troublesome Boy by Paul Vasey is published by Groundwood Books, (2012).